Everyone loves food. Some people go as far to say that they live to eat rather than eat to live. And why would they not? Our world is full of some great, taste-bud tingling, aromatic, delectable savories. We have our pizzas, burgers, hot-digs and what not to fulfill our carnal desire of hunger. We often want to try new things in life. We want to learn new cultures and languages, see new traditions and of course, taste new food. We can go far for our desire to taste something new. Like Caviar is a delicacy in France and squids are an everyday thing in Spain and camel meat is commonly eaten in Middle-East and some African countries. But how exotic is too exotic? The world, while full of appetizing foods on one hand, also have some of the wackiest, offensive and bizarre foods which parade under the name of ‘exotic foods’. The world is a weird place, sure. But the food eaten in some part of the world is bizarre beyond imagination. Here is a list of the top 10 exotic food from around the world and we suggest you keep your food aside if you’re reading this. Oh, nothing much, just a poisonous species of an icky looking, hairy spider that is deep-fried till perfection. That’s right! 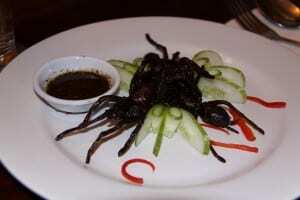 In Cambodia, the Thai Zebra Tarantula, which is about the size of a human hand, is a common delicacy. These can be found everywhere in Cambodia- from street-side vendors to expensive restaurants. The tarantulas are pan-fried with garlic and a pinch of salt. It is crispy on the outside and gooey on the inside. Most people only eat the legs and upper head, which is said to be extremely crispy, but the brave-hearted also eat the abdomen. The East- Asians do love their insects and how. This Japanese food item of Wasp Crackers is exactly what it sounds like. Wasps are caught, boiled to death, dried and then simply mixed into a batter or dough of crackers. Imagine a chocolate chip cookie but instead of chocolate chips, you have wasps! Wasp crackers are extremely famous in Japan and are extremely cheap too. 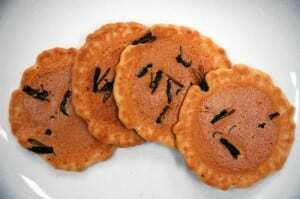 These Wasp Crackers have created quite the buzz around the global food market recently. Do you remember fighting from breath every time you passed by a science lab with ammonia and sulfur? Now imagine eating it. 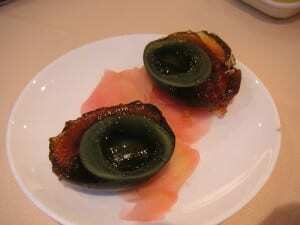 Century eggs or millennium eggs are a Chinese dish in which the eggs of quail, chicken, and duck are covered in ashes, clay salt and preserved for months together. The insides of the egg decompose and form a greenish jelly-like mixture which is then served straight on your plate. Their taste is extremely strong but the dish is very well liked in China. Not all the exotic food items are from the east. Some bizarre food items from Europe can also shock you for their ingredients. 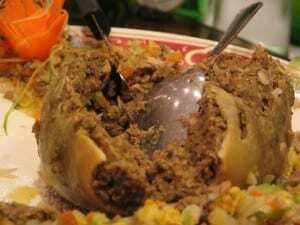 Haggis is a dish from Scotland. It is a savory pudding containing sheep’s liver, heart, and lungs. This is mixed with some chopped onions, spices etc and then again, encased in the stomach of the sheep and simmered. Although this dish doesn’t sound appealing, it is said to have great texture and taste, two things that food connoisseurs are always on the lookout for. Balut is a duck meat dish. Now, eating ducks is completely normal and people from all around the world eat duck meat. But this dish serves duck with a twist. 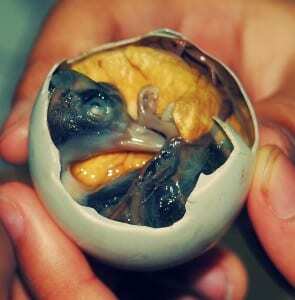 Balut is a dish served mainly in the Philippines which is basically fertilized duck egg. The eggs are served with a hole and they contain a grown duck embryo. To perfectly get the taste, you have to pierce the duck eggs first and drink all the liquid inside it and then break the shell and eat the entire developing duck baby. Mostly, Baluts are eaten when the egg is 17 days old but some people wait till it is 21 days old and the duck has developed beak and feathers! You read that right. There is actually a dish in which you can eat bear claws! 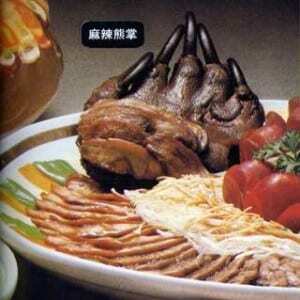 This bear claw stew is a Chinese delicacy and it costs a bomb. It said to boost your health and sexual performance and so, people do burn a hole in their pockets and eat this. But this delicacy is facing some problems today as the animal rights activists are protesting against the apparent torture of the bears before the killing and cooking. The torture of the bears releases some toxins and hormones in the bear which give it the taste that it has. The Chinese sure do take the award for having the most number of exotic foods. Durian is, one could say, less painful to the eye but a pain to the nose. 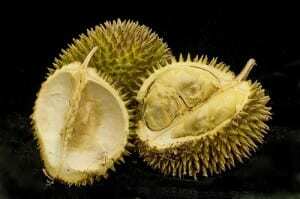 Durian is a fruit which is rather yummy-looking which has a very strong and foul odor. The fruit can be eaten raw or can be used to make a variety of stuff. But it smells so bad that people who have smelled it said it was a mixture of rotten eggs, vomit, rotting flesh and sewers. In fact, it smells so strongly that it has been banned in many hotels in Asia and is banned from airports all around the world! Live Cobra Heart is not a common thing to eat but some people in Vietnam do it. If that wasn’t bad enough, you should know that the Vietnamese eat live cobra’s heart raw and uncooked. 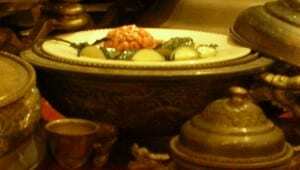 And to top it all off, the only ‘preparation’ to this dish is that they wash the cobra’s heart with the cobra’s blood! Takes bizarre to a whole new level, doesn’t it? People who eat this dish think that they will endure the powers and strengths of the Cobra and so, they don’t even clean it, just swallow it whole, while it is still beating. This dish is definitely not for the faint-hearted. This dish is rather controversial but the fact that someone even thought of eating a monkey’s brain is enough for putting off a lot of people. 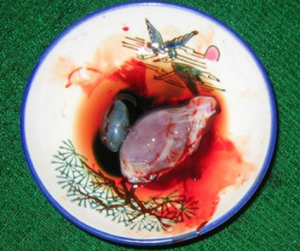 Monkey brain is eaten in China and other East-Asian countries. The brain is cooked with spices or it is eaten raw. What made this dish a controversy is the fact that monkeys are placed at a very high order in the food chain and experts say that the act of eating a monkey’s brain can lead to cannibalism. It is said that the monkey’s brain can cure erectile dysfunction but in fact, eating it is very dangerous and had many health risks. What could be worse than eating a monkey’s brain? This Italian dish is your answer. Italian cuisine is not all about pizzas, pasta, and gelatos. Casu Marzu is a rather unappetizing dish. It is a type of sheep milk cheese which contains live insect larvae. Now, all cheeses have to go through the process of fermentation and we know about the presence of bacteria in that process. But the process that goes into the making of Casu Marzu is less fermentation and more decomposition. 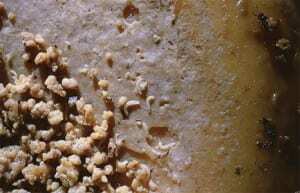 The live larvae are said to give the cheese a unique taste and soft, gooey texture. No matter how tasty this is, getting someone to eat a dish when you can clearly see worms wriggle in it is definitely a task that the Italians mastered!